The Barrie Colts history at the #NHL Draft. #OHL - Very Barrie Colts | A website covering the Barrie Colts of the OHL. With the NHL Draft right around the corner we figured we would take a look at the Barrie Colts history at the NHL Draft. Last years draft was a good one for Colts fans when Aaron Ekblad became the first player in team history to get selected 1st overall when the Florida Panthers selected him. Though 11 Colt players have been selected in the 1st round since 1996 this was the first time a player from Barrie was selected in the first overall spot. Before Ekblad was selected first; you would have to go back to the 1996 draft when Alexandre Volchkov became the highest drafted player from the Colts when the Washington Capitals selected him 4th overall. 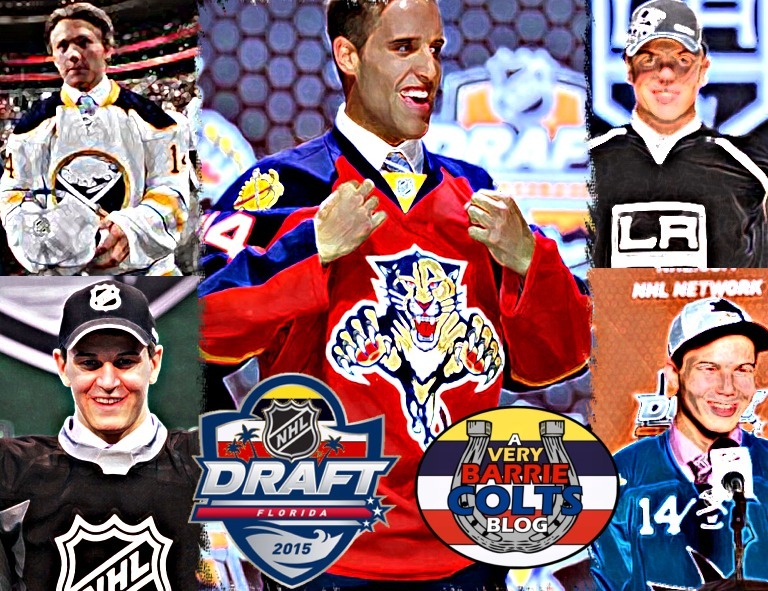 The Colts have some strong prospects headed into the 2015 NHL Draft. To take a look at the bio's we put together click the links below. Barrie Colt 2015 NHL Draft Prospects: Mackenzie Blackwood. Barrie Colt 2015 NHL Draft Prospects: Rasmus Andersson. The 2015 NHL Draft will take place June 26-27 from Sunrise, Florida. Here is a complete history of Barrie Colts getting selected at the NHL draft as well as a breakdown of which NHL teams have selected the most Barrie Colts and a breakdown of how many Colts have been selected through 7 rounds.